Need to get 9675kB of archives. After unpacking 35.4MB of additional disk space will be used. Selecting previously deselected package libadns1. Selecting previously deselected package wireshark-common. Selecting previously deselected package kismet. Without proper configuration kismet will not be able to run. ipw3945 is your wireless card chipset modul. How to know that ipw3945 is the right module? Now, I know that my chipset is Intel Wireless 3945. Then, how could I know which module that I should use? Source type: ipw2100 Intel/Centrino Linux ipw2100-0.44+ http://ipw2100.sourceforge.net/ The Linux IPW2100/Centrino drivers for 802.11b cards now support rfmon, so here's support for them. They act more or less like any other wireless interface would. 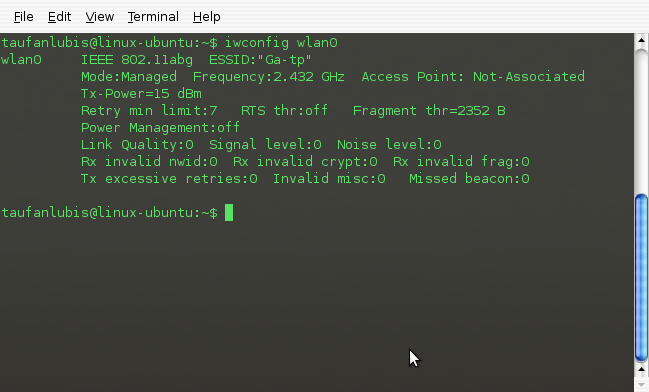 Source type: ipw2200 Intel/Centrino Linux ipw2200-1.0.4+ http://ipw2200.sourceforge.net/ The Linux IPW2200/Centrino drivers for 802.11bg cards support rfmon as of 1.0.4 and firmware 2.3.Signal level reporting requires radiotap be turned onin the makefile while compiling the driver. Noise levels are not reported. Source type: ipw2915          Intel/Centrino Linux ipw2200-1.0.4+ http://ipw2200.sourceforge.net/ The Linux IPW2200/Centrino drivers for 802.11bga cardssupport rfmon as of 1.0.4 and firmware 2.3.This is the same as ipw2200 but defaults to scanning the 802.11a channel range in addition to 802.11b/g.Signal level reporting requires radiotap be turned on in the makefile while compiling the driver. Noise levels are not reported. Source type: ipw3945          Intel/Centrino Linux ipw3945 http://ipw3945.sourceforge.net/ The Linux IPW3945/Centrino drivers for Intel Core 802.11bga cards. As you see, Chipset Intel 3945 a/b/g uses ‘ipw3945’ source. ^L— Force a screen redraw. 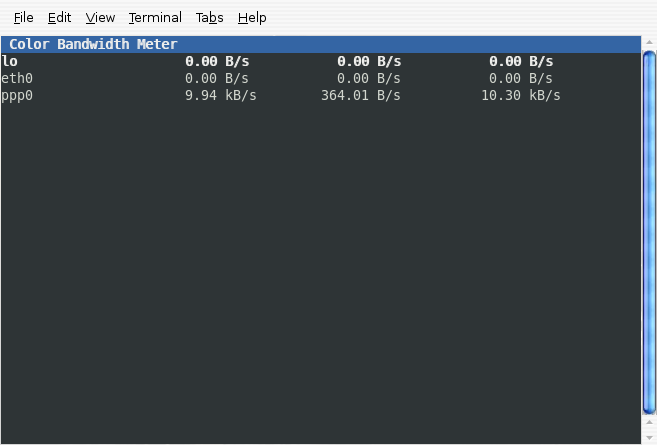 Measure and display the rate of data across a network connection or data being stored in a file. Need to get 179kB of archives. After unpacking 889kB of additional disk space will be used. Selecting previously deselected package python-urwid. Selecting previously deselected package speedometer. 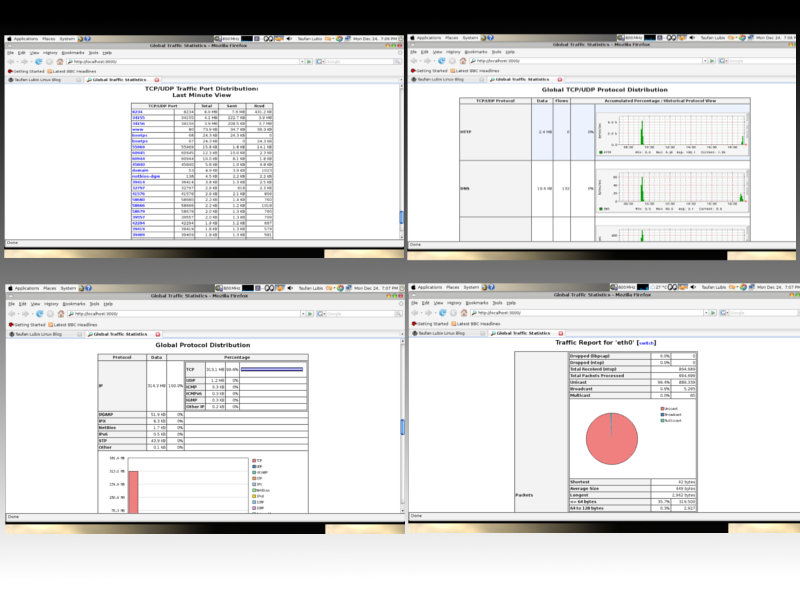 pktstat listens to the network, shows and summary the bandwidth being consumed by packets of various kinds on an interface in real time. 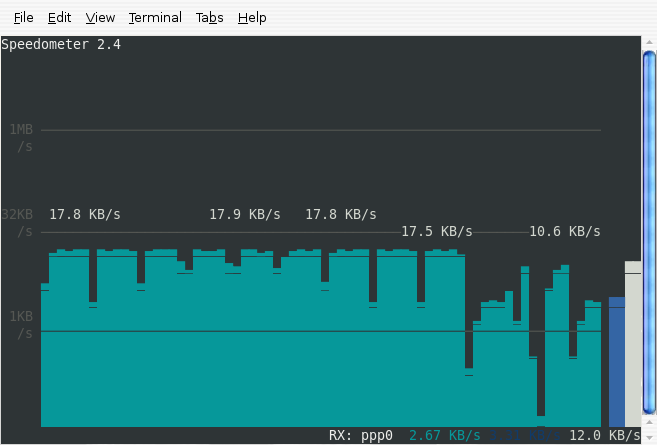 Each line displays the data rate associated with different classes of packets. 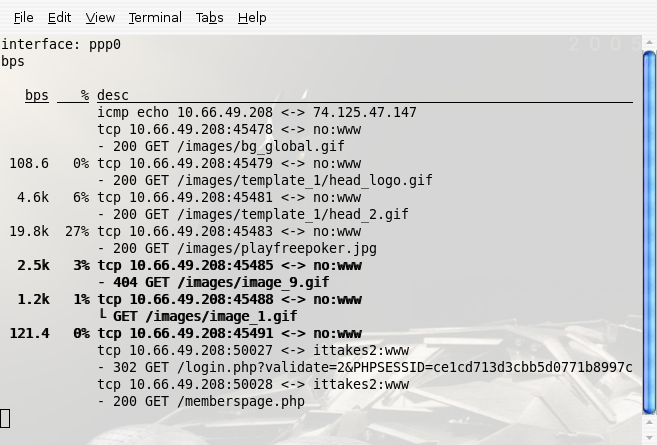 It understands some protocols (including FTP,HTTP, and X11) and adds a descriptive name next to the entry (e.g., ‘RETR cd8.iso’, ‘GET http://slashdot.org/’ or ‘xclock -fg blue’). Need to get 30.1kB of archives. After unpacking 102kB of additional disk space will be used. Selecting previously deselected package pktstat. 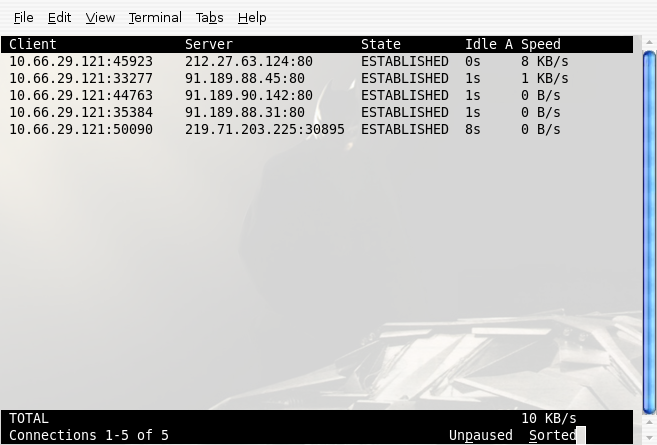 taufanlubis@toshiba:~$ sudo pktstat -i ppp0 (I used point to point, for my connection). The CBM or Color Bandwidth Meter displays current traffic of all network device. This program is so simple that is should be self-explanatory. Need to get 21.3kB of archives. After unpacking 90.1kB of additional disk space will be used. Selecting previously deselected package cbm.